Join us on Saturday, September 10th, 2016 from 12PM to 4PM for the next Repair Fair. Our hosts are Tyler School of Art at Temple Contemporary, 2001 N 13th Street on the Temple University campus. All are welcome to bring their broken possessions to this free event. 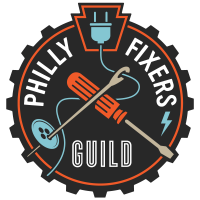 Our troop of talented volunteer Fixers will teach you to troubleshoot and make appropriate repairs. We encourage self-repair to minimize waste and save resources.